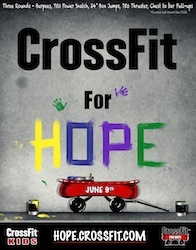 On Saturday, June 9th, I will be participating in CrossFit for Hope. In essence, CrossFit for Hope is a day for one workout and one cause–to benefit St. Jude Children’s Research Hospital. Donations for me can be made by going here. Now, as an author, I also wanted to give more than just my time, energy and sweat. I wanted to donate my words. Therefore, the poem below is about Hope, about its existence around us, and its power. Feel free to share it (#CrossFitForHope; #CrossFit). Let it be a piece read on June 9th, prior to the workout. Let it be a piece that reminds you of the symbolic element of CrossFit. Let it be a piece that helps you float on, in spite of the weight of this world. We need only to look up. upon which we shuffle, plod, get by. if we just look up. to receive assistance with our task. that sensation of hope—its buoyancy. And we are lifted by its strength.